No Gender is a massive weapon, a response to the no menswear's land at NYFW. Wondering why there is no men fashion week. No place on the calendar? No sponsorship or partnership to support? Some designers are going to showcase in London or Paris and others choose to combine the two lines in one runway, but other like Hood By Air erases the gender. Is it a deliberate choice? Perhaps it is and we love this idea. 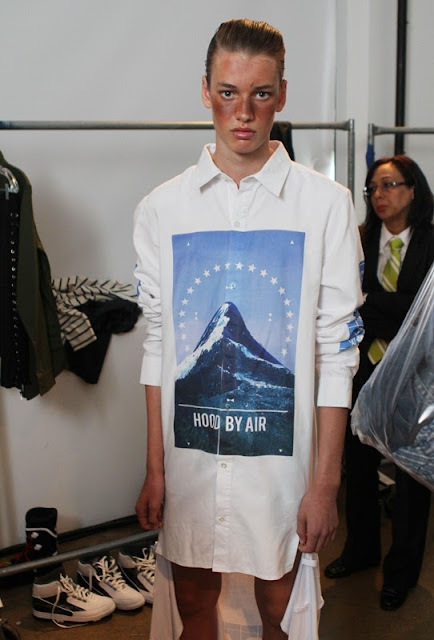 Having little informations about Hood By Air (HBA), just known that the label was created by Shayne Oliver seven years ago, by tagging his brand name on tee-shirts. The proccess of tagging HBA on tee-shirts, shirts, pants...etc on the litteral level is to create a violent eye-catching effect, showing what you wear, hence who you are. On another level, it is an agressive reference to streetwear, being part of HBA gang, like establishing your identity and your uniqueness. Apart from the red and black oufits, the colour palette are soft, contrasting with the styling which is an overdose of layering. 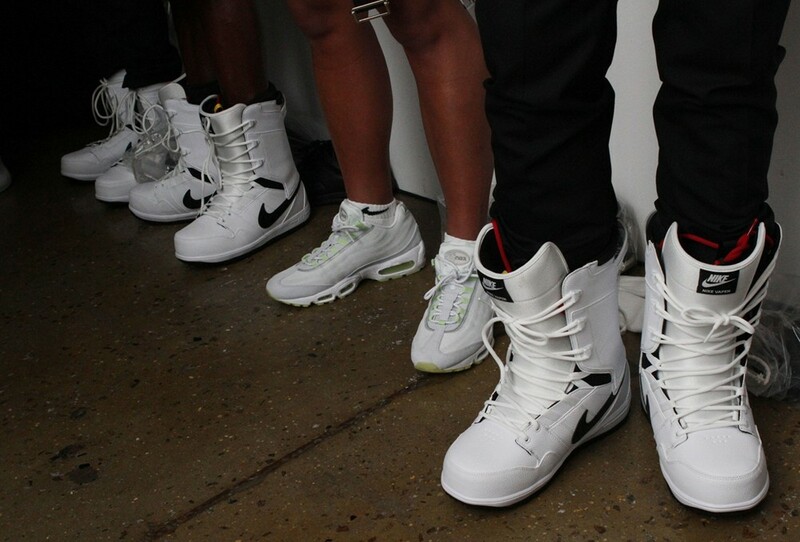 This collection stands out between all the conformism sportswear attitudes at NYFW. It is easy to make the comparison, but we do not care because we choose the uncompromising and anti-conformist HBA aesthetics. Oliver said "the collection is about redefining Americana" and for his inspiration he quoted "American military uniforms, Air Jordans and Space Odyssey". Here "No gender" or "lack of androgyny" is a weapon to change the American way of life, which will break or put an end to traditional sportswear. It sounds crazy but we love the extravagance and the collection got the power and the skills to eclectrocute people. Oliver plays with the concept of androgyny without inevitably giving a "boys meet girls" attitude when you see the first models on the runway, but you get more confused after seeing the no gender boys/girls. His concept is jutified by the appearance of the androgynous performer Boychild, obviously a standout moment. This collection is confusing like Thom Browne SS14 American Horror Story Asylum. HBA is definitely part of the American landscape, one cannot deny it. This is a kind of beauty that looks ugly, which people often want to ignore, because it somehow ruins their American dream idea, but HBA is part of it. We want to be part of this American life, loving all the printed shirts, zipped tops and jackets and the skorts. 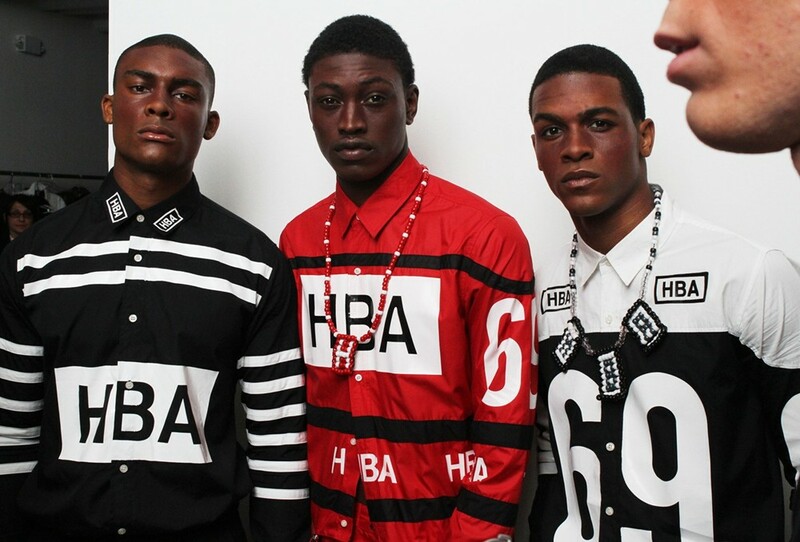 Now we are going to hurry on the web to find where we can get HBA clothes because it is our American dream obsession. So, Long Live HBA! All these pictures come from Dazed Digital.